*The application will be closed on a first-come, first-served basis, early purchase is recommended (Japan time). *Please click following URL for Entry and Application Procedures. If this is the first time you are using JTB sports station,you need to complete the process of new membership registration in advance. *Information will sent via email in advance to your registered address about 2 or 3 weeks before the event day. 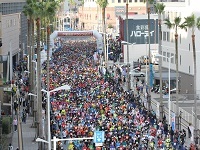 【Marathon(42.195km)】Number of Participants is 10000. 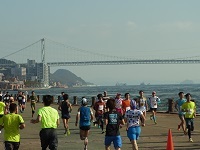 【5km】 Number of Participants is 1000. 【2km】 Number of Participants is 1000. *The participant’s age on the day of the event will be applied to the age categories. *High school students are students enrolled in high schools and/or those of equivalent ages. *The runners who are overall top 3 entries men and women of Shimonoseki Kaikyo Marathon 2017,the entry fee is exempted for the category. 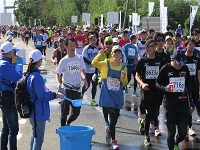 If the participant will use running aids, the participant may participate in the 2km fun run category on the condition that the organizer allows that it will not disrupt the event operation. Due to event operation, 11 cut-off time checkpoints will be set in the marathon course. Athletes who fail to pass each checkpoint before cut-off time, or who lag excessively behind the cut-off time must abandon the race immediately and get on the accommodating vehicle according to the staff’s instructions. Time limits will not be set, but participants may be asked to abandon the race if it disrupts the event operation. Official records will be the actual time from signal shot to finish. Recording chips automatic timer system will be used for recording. Recording chips will be delivered beforehand. *2km The Fun Run will not be recorded, but please wear the recording chip for racing verification. Finals referees will decide the rankings of the overall top 10 men and women of the marathon event. Records by the recording chips automatic timer system will decide the other events’ rankings. *Finishers will be given finisher certificates on the day of the event. Record certificates with split time per 5km and photos can be downloaded later from the event homepage (link on RUNNET). *Finishers will be given finisher certificates on the day of the event. Recordings or prize-giving will not be conducted. By applying, participants must agree to abide by the following rules. (1)Once applications have been received, no requests due to personal circumstances for cancellations, change of registration contents(category etc.) on the application. Neither over payment nor duplicate payment will be refunded under any circumstances. (2)In the event is canceled due to earthquakes, floods, typhoons, blizzards, epidemics, and other natural or human disasters and accidents beyond the control of the event organizers, it will be decide by organizer if they can make any refund. Also, the refundable amount will be belong to the organizer's decision. (3)The provision of false information (age, gender, result, etc. ), or participation in the marathon by a different person to the registered entrant, is not permitted. Any applications found to contain false or misleading information after submission will be canceled and no refunds will be made. (5)The event organizers reserve the right to use and publish in print, visual media or online materials, any video footage, photographic images, or written articles any entrants' likeness and details such as name, age, location (country, prefecture, or town name) and results.